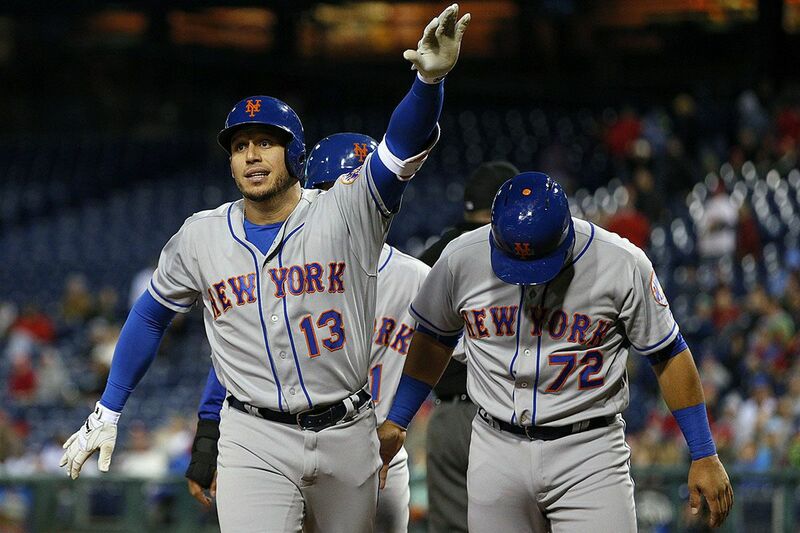 New York Mets’ Asdrubal Cabrera, left, reacts to his three-run home run with Norichika Aoki, center, and Phillip Evans, right, during the 11th inning of a baseball game against the Philadelphia Phillies, Saturday, Sept. 30, 2017, in Philadelphia. The Mets won 7-4 in 11 innings. The shelves in Pete Mackanin's office were empty Saturday afternoon, a few hours before a 7-4 loss to the Mets. Most of the his belongings — baseball caps, photos, and other mementos from his time as Phillies manager — were packed in a cardboard moving box. Mackanin, who has worked in professional baseball for 49 consecutive seasons, learned Thursday that he will not manage the Phillies in 2018 and instead will be a front-office adviser. The baseball lifer grinded for more than three decades to make that office his own. One game — Sunday's season finale — is all that remains. "I look back at my career, and I felt this was the best thing I could ever have done in my life," Mackanin said. "If you're not tough enough to go through the ups and downs it's going to be tough, and you are going to be miserable. You've just got to be a fighter and keep pushing." The Phillies lost on an 11th-inning, three-run homer by Asdrubal Cabrera off Adam Morgan, who allowed his first homer since July 31. Morgan was burnt by his change-up, a pitch that blossomed in the summer as he became a reliable bullpen arm. "I'm still going to use it. It's one of my strengths," Morgan said. "Moving forward I'll just kind of erase that from my memory and keep going." The team's second-to-last game of the season was likely the final game for catcher Jorge Alfaro, who left in the sixth inning after being hit in the head while making a tag at home. Alfaro moved up the third-base line to field a throw from Nick Williams and was hit by baserunner Juan Lagares' elbow. Alfaro dropped to the dirt and was dazed before walking off the field. "He made a great throw home. Alfaro made a great tag. But he hit the back of his head," Mackanin said. "I just took him out for precautionary reasons. I think he's going to be fine. The doctor checked him, but we'll know more tomorrow. He told me he was fine, but I didn't want to take any chances." Phillies starter Henderson Alvarez allowed three earned runs and walked six batters without a strikeout in 4 2/3 innings. The 27-year-old allowed seven earned runs in 14 2/3 innings over three starts with the Phillies. They signed him in August to a minor-league contract, and his future is uncertain. Maikel Franco homered for the second-straight night and the third time in four games. Rhys Hoskins tied the game at 4-4 with a single to left. The Phillies needed to win either Saturday or Sunday to clinch their first winning record against the National League East for the first time since 2011. They have a 36-38 record since the All-Star break and will score more runs this month than any month since May 2012. There is hope. And if these Phillies do become winners, credit Mackanin for being the man who ushered many pieces of the next contending Phillies team into the big leagues. "I would truly like to be here when this team wins," Mackanin said. Mackanin's title after Sunday will be special assistant to the general manager, but his duties are not fully defined. He expects to offer his input to GM Matt Klentak whenever needed. Perhaps, Mackanin said, he could evaluate players who the Phillies are looking to acquire. He will work from his home in Scottsdale, Ariz.
"Hopefully not a lot of travel," Mackanin said. "We haven't said exactly. I don't have a schedule right now. He's been great about that. I told him that I'd like to do, and he is going to try to accommodate me. … Whatever he wants me to do, I'll do." Mackanin left his parent's home on Chicago's South Side in the summer of 1969 to begin climbing baseball's ladder. He reached the majors four years later and played parts of nine seasons. Mackanin retired in 1981 and opted to climb again. He wanted to be a big-league manager, and it took nearly 35 years to realize it. Mackanin spent 27 months as Phillies manager before it was time to pack up his office. The baseball man finally reached his goal. And now it's over. "One thing I am proud of is I've been a minor-league player, a minor-league manager, a minor-league field coordinator, a major-league advance scout, a coverage scout at the big league level. I've been a coach in the major leagues, third base, bench coach, interim manager, manager," Mackanin said. "I've done pretty much everything there is to do other than GM, which there is no way I would want that job. So I am proud of the fact that I have done all those things. And after 49 years, it's a long time in any industry, and not a lot of people can get that far."